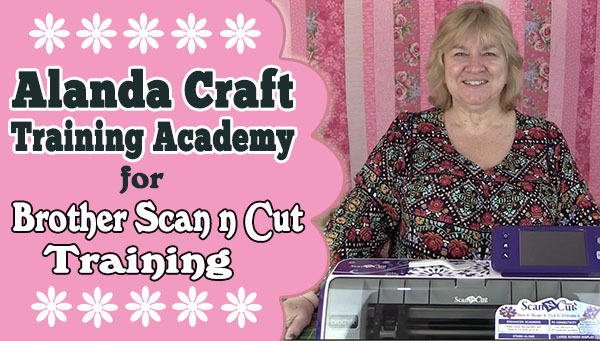 The Alanda Craft Training Academy is now open for Brother ScanNCut training, Dream Machine and Quilting courses. Our first training course is ‘Getting Started’ using your Brother ScanNCut. This is a fully comprehensive ScannCut Training Course with over 25 downloadable videos and written instructions that can be downloaded in PDF format. This is the first training course in a series of five. I have to say that it has been a lot of work but it has been well worth it. For those of you who follow us you know that we love our Brother ScanNCut and we have had so many emails from people who just aren’t getting the use from their machine that they should. This first course is for those who have just bought a ScanNCut or have one sitting in a cupboard and are frustrated or daunted by it. We have demystified the Brother ScanNCut for you. The second course is for those that are past the beginner stage and need more advanced training. The third course is for the online Canvas Workspace. The first of our Brother Dream Machine Training Courses is available with a project based course teaching you how to use My Design Center. It will take you through how to design and digitize your own zippered pouch. More Dream Machine tutorials are on the way. Our one and only quilting course is for those wanting to create an art quilt. This is perfect for beginners who have never created an art quilt before. Step-by-step video and written instructions. I am so excited that you are offering this class with written instructions. I have had my scan n cut for 2 months and it was 7 weeks before I had a class. It was not worth the wait. I was ready to put it in the garage. I had no idea how to use it in regards to fabric. I did not know what the icons were, or how or when to use them. Scrapbooking is for 30 to 40 year olds mostly. I am a senior and have been sewing since I was a child, and I thought this would be an opportunity to share with my granddaughters. My age group did not learn by watching u tube. There were no step by step instructions. We learned by reading and doing. I passed your e-mail along to a couple of women who attended the scan n cut class and told them to pass it along. We really wanted to cover all bases with the course. Paula prefers video tutorials and I, like you Peggy, prefer written instructions. Both mediums are important these days. We do have a fabric cutting course coming shortly but in the first two courses we want to make sure everyone is quite comfortable with cutting out paper and mastering their machine. When we teach courses to ladies who are really only interested in cutting fabric we still start them off with paper. It’s the easiest medium to use when starting out. Practicing with paper means you don’t waste your precious fabric while you are learning. Thank you for sharing the Alanda Craft Training Academy with your friends, we certainly appreciate it. I think you gals are the best!! I have a love/hate relationship with my 650 W. When it works well, it’s a dream come true. When it doesn’t I want to toss it out the window. Still, a question: what factors determine changing the cut speed and pressure? I chewed up my first mat, and am scared of doing it again. But sometimes deepening the blade depth doesn’t cut all the way through. Also when you do Course 2 about fabric, can you say if the fabric support sheet can be removed?? I have a 24 in mat, but don!t want to sacrifice it to fabric only. Also, any tips on scanning your own designs? This was the main reason I bought this machine, but scans are often “skippy ” and sometimes one part of the card will cut fine, but another part doesn’t. Aaaaaargh!! In relation to the fabric sheet, yes it is removable however because the blade cuts through that fabric sheet it can make so many cuts that it breaks up the fabric sheet into little pieces. So when it comes to removing it, it can be extremely time consuming. I signed up for the 100 free files and paid $9.99 for a set. I have no idea where they are, how to access them. I also got a little card with access to files with the San n cut but I don’t know how to access them either. Help! I’ve replied to you via your email Vicki. Can u tell me the cost of the classes? Here is a link to the classes Linda. They vary in price according to which topic you are interested in https://www.alandaonline.com/product-category/brother-scanncut/. When you get to this page just click on the view product button to see the description of the course and the price.